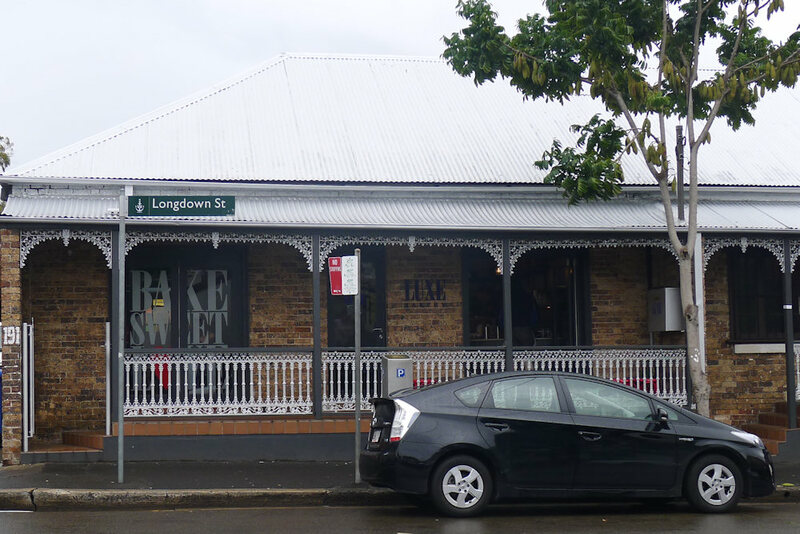 Situated just off busy King Street in Newtown, Luxe Bakery and café has taken up residence in an old house. The interior is quite spacious and airy – the skylights and high ceiling gives it a nice open feel. The downside is that the interior can be very loud. As the crowd dissipated during our visit, it became more bearable. There are plenty of large shared tables inside and a handful of chairs on the balcony. 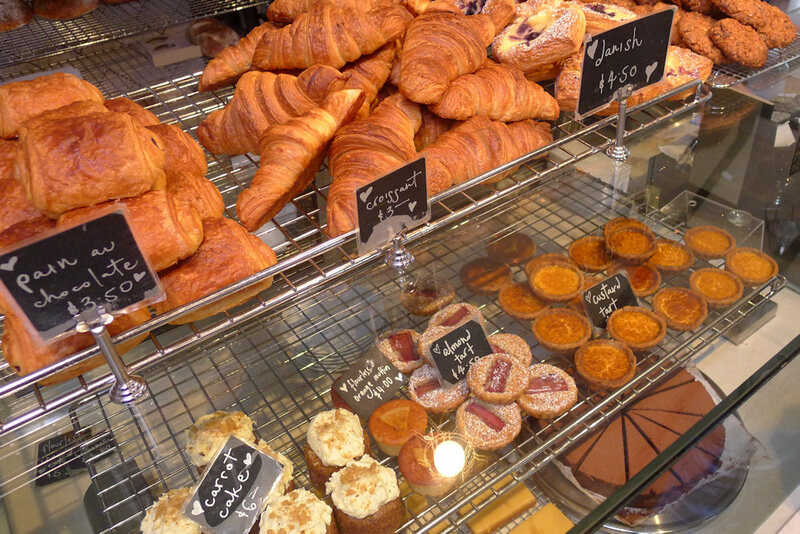 Bread and baked goods are the stars here with some delicious looking sandwiches and pastries behind the counter. The lone waitress was run off her feet this morning. There were other floor staff however she seemed to be doing all the work and although extremely busy and flushed, she was humorous, courteous and professional throughout our breakfast. The first espresso was terribly bitter and hard to swallow. When the waitress asked how it was we replied honestly and she called the barrista over to speak with us. 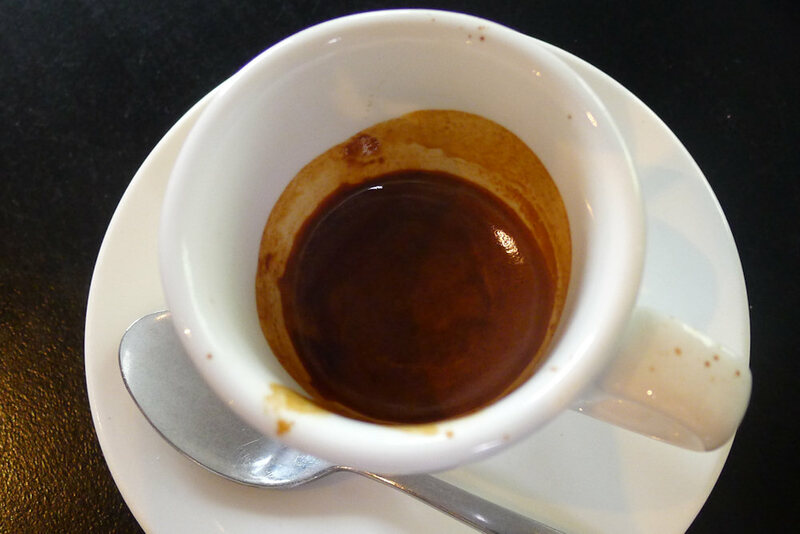 We were promptly offered another espresso, this time of the ‘gold blend’ however it wasn’t remarkably different. We’ve heard good things in the past from other café goers, so perhaps they were having an off day. There are no fresh juices, smoothies or milkshakes on offer however there is a fridge with bottled drinks. 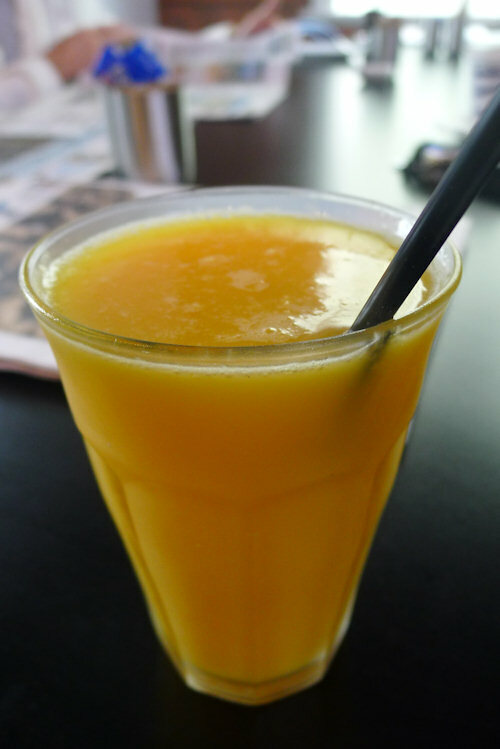 Orange juice of unknown origin was suggested which we tried. Although it isn’t freshly squeezed, it did help Dane to ease the bitter taste of April’s espresso! 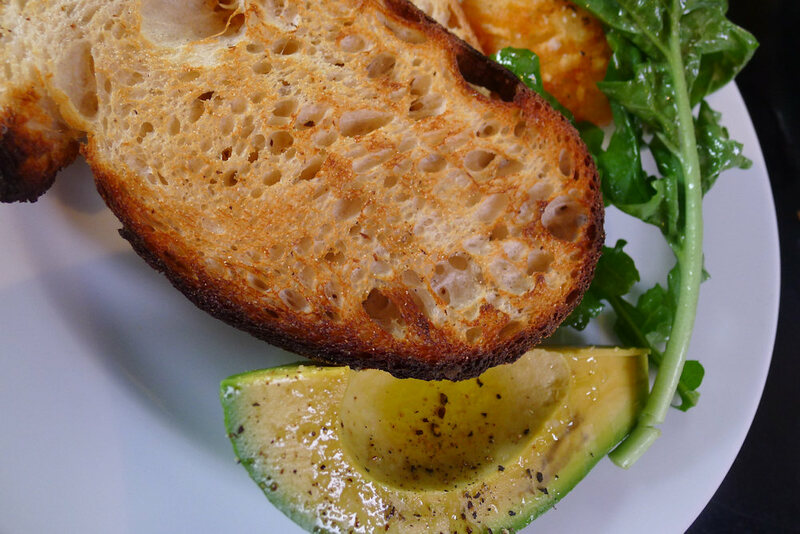 The sourdough toast ($6) with sides of avocado and potato hash ($4 each) was a bit more expensive than we’re used to. The potato hash was the stand out in this dish with the bread a close second. The avocado was slightly hard but we still managed to spread it over one piece of toast. With a dry piece of toast left we were wanting more so ordered some jam on the side. 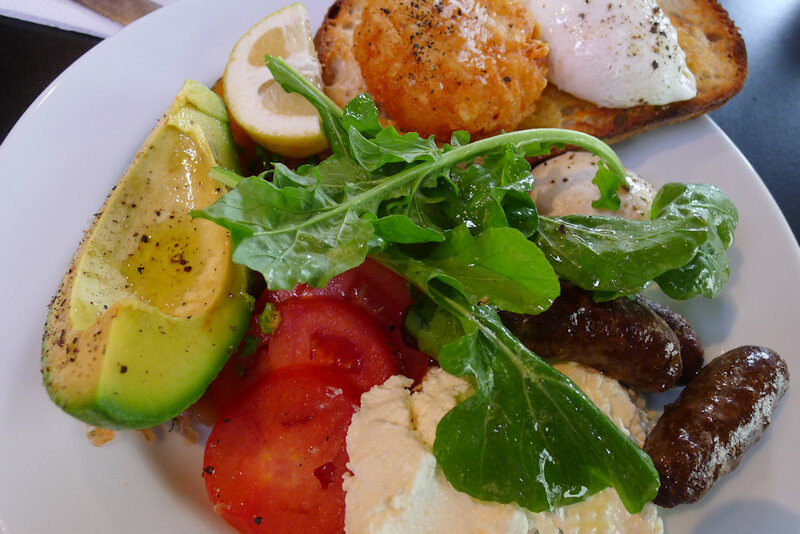 The organic free range eggs with sourdough toast ($10.50) is the main hot dish on the breakfast menu. The eggs are only available poached or scrambled (why?). This dish can then be customised with numerous sides which Dane endeavoured to try most of: potato hash, ricotta, Lebanese sausage ($4 each) and cured ocean trout ($5). The other sides on offer are baked beans, mushrooms and fried leg ham (which looked amazing) ($4.50 each). Navigating around the plate the avocado and hashbrown were the same standard as April’s. The sausages were very spicy which Dane enjoyed however they easily dominated the other flavours on the plate so perhaps they should just be ordered with the eggs and tomato. The side of ricotta was very generous and deliciously smooth. The trout (hidden beneath the avocado) tasted great and would work well with the avocado on toast. The eggs had been cooked slightly longer than usual but still runny in the centre. Although the ingredients we ordered do not all work well together, everything was of a high quality. Dane did find the bread to be quite tough to get through which made eating the full plate of food awkward. We do believe that we have done ourselves a disservice by not tasting the baked goods other than the toast with our breakfasts however we simply could not eat another bite! Luxe does have a fantastic reputation for their breads and pastries though. The queue of people buying them was constant and we will definitely be passing by soon to sample some more of what they have to offer. Newtown is a great suburb to enjoy in all weather. See a film at the Dendy Cinema or drop some cash in one of these fun stores: Octopus Design, Mag Nation or Yoshi Jones. If you’re looking for a good coffee fix, try Campos coffee on the next corner from Luxe. In our experience they’ve never failed to deliver high quality, simply delicious coffee. This entry was posted in Sydney - Inner West and tagged Free range eggs, Organic Options, Outdoor seating. Bookmark the permalink.